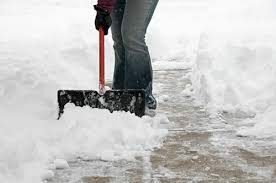 We know it’s a chore, but we would like you to make a special effort to keep your sidewalks clear of snow and ice that are adjacent to your property or business. City Ordinance Section 1317.01(S) requires all walks to be cleared within 24 hours after a snowfall. This is a law and just a good neighborliness way to keep the sidewalks shoveled and clean. Think about the children heading for the bus or walking to school, or senior citizens going to the corner store of the doctor. Please don’t force people to endanger themselves by walking in the streets. If you are a merchant, we are sure your customers will appreciate the extra effort to keep the sidewalks out front passable. In asking you to keep your sidewalks clear, we recognize the health hazards of shoveling show. Know your limits and don’t overdo it. Speaking of neighborliness, try to help older residents who can’t shovel snow. Or, “hire” a youngster who is interested in making a little extra spending money would be a great idea as well! 905.07 DUTY TO CLEAN SIDEWALKS; REMOVAL OF SNOW AND ICE. (b) Any person having possession of a lot or parcel of land in the City shall clear the portion of the sidewalk adjacent to his or her lot or parcel of all accumulations of snow and ice within twenty-four hours after the cessation of a storm. If, for any reason, it is impossible to remove all the snow and ice which adheres to the sidewalk, the owner, occupant or person having charge of the adjacent lot or parcel shall cover the surface of the sidewalk or path with a coating of sand, ash or other substance as may be necessary to render travel safe and convenient.